Troy Pro Style Straight Barbells with Black Rubber End Caps - Set 20-110lbs - are quality engineered and built to last. These commercial pro style fixed barbells are pre-assembled to ensure that all TROY products meet the standards required in heavy used commercial applications. These rubber encased barbells are Troy's top of the line and offer the highest quality available today! Large easy to read numbers on each end of the barbell allow for easy weight selection. The Troy Pro Style straight barbells with black rubber end caps - Set 20-110lbs - is a high quality, commercial grade barbell set that is designed for any heavy use setting. The knurled grips provide a good surface for a secure hold that is safe and feels good in the hand. Barbells are great for developing definition and muscle mass. This 20 to 110 lb set comes with one barbell in 10 lb increments. 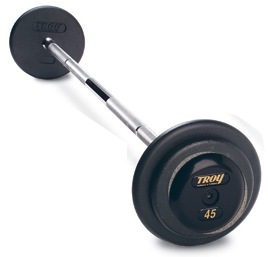 Call 1-800-875-9145 to speak with one of our fitness advisors with any questions you may have or Order your Troy Pro Style Straight Barbells with Black Rubber End Caps - Set 20-110lbs from FitnessZone.com today! Order your Troy Pro Style Straight Black Barbells Set 20-110lbs from FitnessZone.com today!